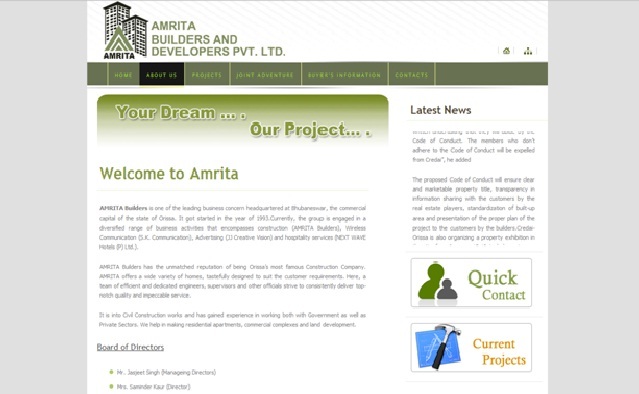 Amrita Builders is a renowned real estate and construction company situated at Bhubaneswar, the Commercial State Odisha. This company was started in the year 2003 with the group of experienced professionals like Quality Contractors, Supervisors, Marketing Managers, Sales Managers, HR Managers, Sales and Marketing Executives and Other Official Staffs to provide all the genuine information’s regarding housing projects to their valuable customers. This company is a diversified company genuinely active in many sectors like Wireless Communication, Advertising sector, and Hospitality Services. The Managing Director of this company is Mr. Jasjeet Singh, and Directors are Mrs Saminder Kaur, Tamarana Dehuri.